Kaarasaaram: Murukku - Vinayagar Chathurthi Special..
Murukku - Vinayagar Chathurthi Special.. Happy Vinayaka Chathurthi to everyone ... I know it is too early to wish but this is my favourite of celebration days. I don't know why but I do have a special attaachment towards Lord Vinayagar. Something about his appearance makes it so easy to like him. I feel he is more of a friendly natured diety when compared to others in Hindu mythology. 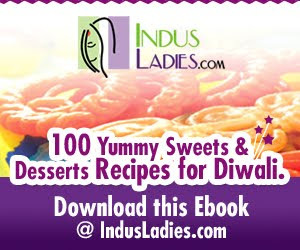 The fun part of Indian festival celebration is that you get prepare and taste so many dishes. Snacks .... Hhhhmmm, there is no other way to put this... "I love snacks"..:)) I don't mean factory manufactured packets which are lined up in the super market shelves filled with artificial flavours and colours. I am a real amateur when it comes to making authentic sweets and savouries. Whenever I try the savoury items something goes wrong, either the batter is not right - murukkus start bursting once it goes in the oil or the batter disperses in the oil..:( or the flavor of the murukku is not right. So I asked the help of an expert ... My MIL's sister. She is a wonderful cook and makes everything from mutton thala kari to murukku to maravalli kizhangu chips to maaladu with much ease. When I do question her about how she learnt all these dishes her reply would be "Ahh, its nothing, I just learnt it by making them". Indeed she also enlightened me with some interesting stories regarding savory snack making. a. When the murukku is put in the oil it floats to the surface with a big sizzle which is named as "Salangai Satham". Salangai means the sound from a series of small bells attached to a piece of heavy cloth which is tied on each feet when dancing Bharathanatyam /Kathak etc. 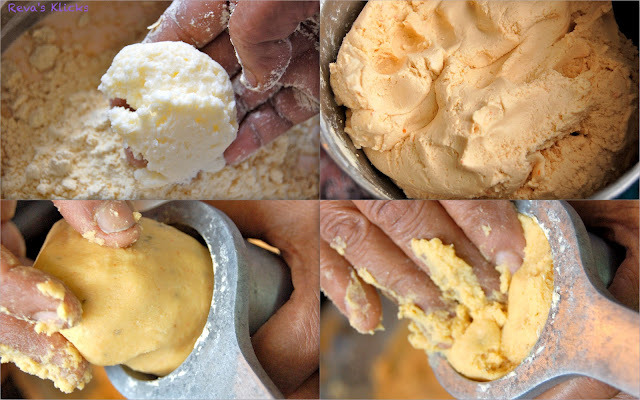 b.When the murukkus are done and the sizzle settles, the sound resembles "Kili Satham" meaning sound made by parrots. I don't know if the sizzles do resemble salangai or parrots but it was interesting just to listen to these small entertaining talks. Recipe Source. Mrs. Nirmala Cinnaswamy. Cumin seeds: 1 and 1/2 tbsp. Salt: 1 and 1/2 tbsp. 1. Wash the rice twice and drain the water completely. Dry the rice on a clean cloth in shade. When you hold some rice tightly in your hand the rice should hold the shape. When you loosen your hold, the rice should fall apart. This is the right moisture content state [patham]. 2.Dry roast the urad dhal on medium flame until it turns slightly red in colour. Remove from flame and cool. 3.Grind both the rice and dhal seperately to a fine powder. Place the powdered rice and dhal in large plates for it to cool completely. 4.Sieve the powders twice and reserve seperately. 5. Mix the powders along with coconut oil, butter, omam, cumin seeds, asafoetida powder and salt thoroughly. 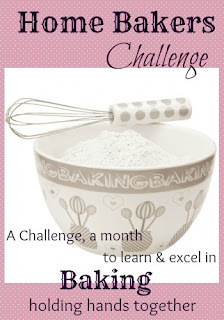 6.Now add water little by little and bring the whole flour mix together to form a soft dough. Meantime heat the required oil on medium flame. 7.Apply some in the murukku maker container and on your hands. Take a small portion of the dough and fill the murukku maker which is fitted with a plate which has 3 tiny holes and keep the rest of the dough aside covered with a wet cloth. 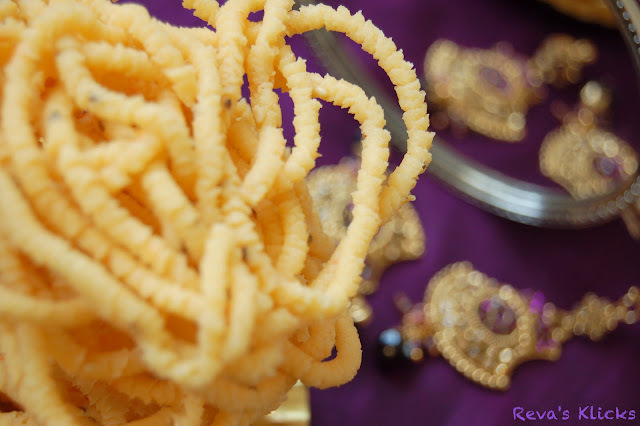 9.The raw dough murukku will automatically detach itself from the ladle and float in the oil [see notes]. 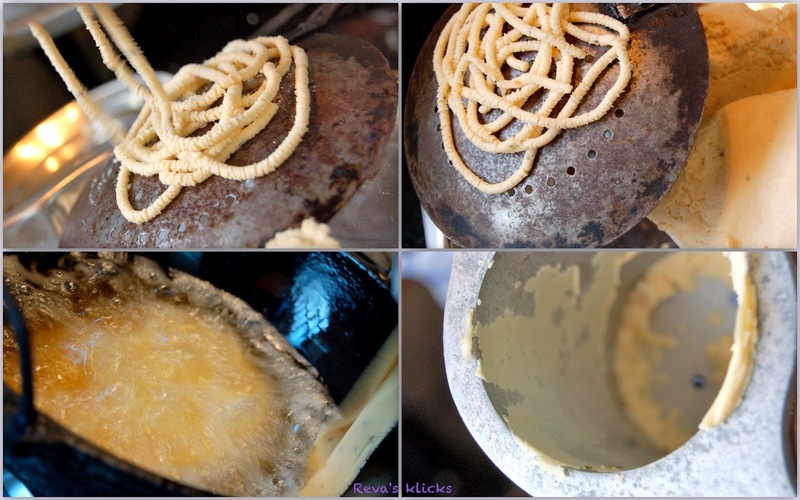 10.Fry upto 3 murukkus at a time as too many at one time will bring down the temperature of the oil. 12.Drain on paper towels and store in air tight container when they are completely cool. 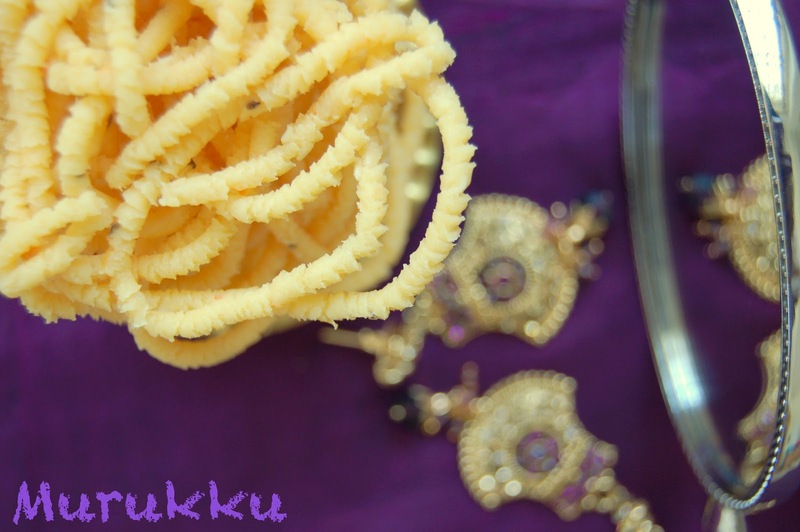 Using coconut oil gives a lovely flavour to the murukku but you can use ordinary cooking oil to make them. I would strongly suggest to use an extra large ladle to squeeze the murukku first and then plunge the ladle into the oil. 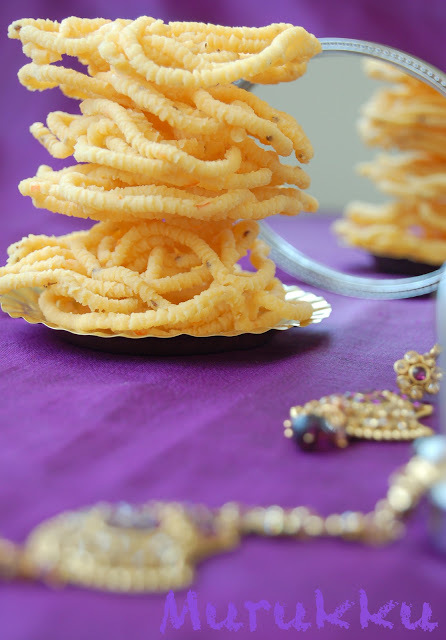 If you are confident, you can squeeze the murukku directly into the oil. The oil should be in the right temperature meaning once the murukku goes into the oil it should float to the top with a big sizzle. It the murukku sinks to the bottom of the vessel then the oil is a bit cold. If the murukku becomes reddish to dark reddish in colour before the sizzle settles, then the oil is too hot. It is best to test the oil temperature by dropping a small piece of the dough into the oil before making the murukku. It is essential to use fresh ingredients as savoury items made with old stuff does not have good flavour nor aroma and goes bad very soon. I have used murukku attachment plate which has 3 tiny holes. You can use other attachments which have one large opening or 3 medium openings according to your preference. 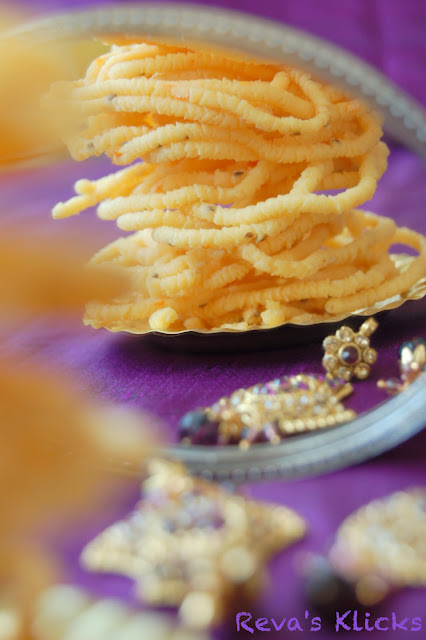 The only thing to take into account is the cooking time of the murukku - the thicker it is the more time it will take to cook. 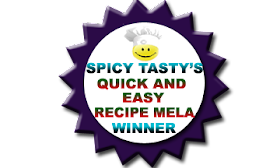 You can use store brought ready made rice flour and urad dhal flour. Dry roast the flours seperately and cool the flours completely and proceed as per the recipe. Lord Vinayagar is all over my house. He sits in my garden and every part of my home. I have a strong attached to him and so the occasion for him is always welcomed. We don't make murukku but we go vegetarian, so plenty of Indian dishes for our rice. Murukku is only for Deppavali. 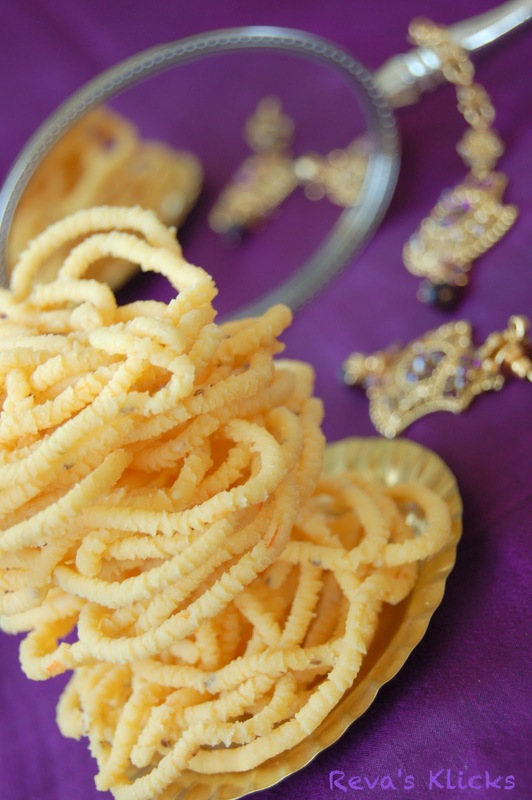 You have made such lovely murukku and these are so tempting. I wish I can do the same but mine always goes out of shape. Mummy dearest is will be there for me when I have to make murukku. 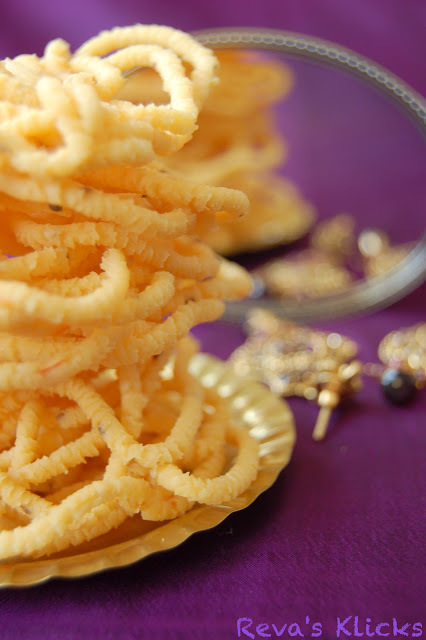 Crunchy munchy murukkus looks super attractive,feel like grabbing some and having rite now. 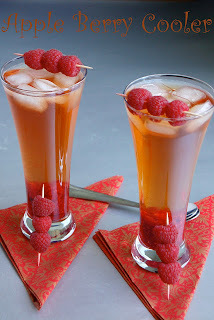 Yummy....... 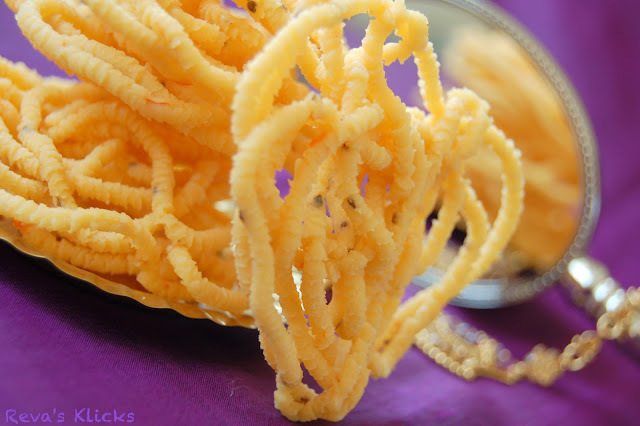 Looking crunchy murukku and nice presentation, Specially the reflection. awesome clicks..the murukkus in the pics are so tempting and irresistible. Lovely pics!! Very much tempting!! 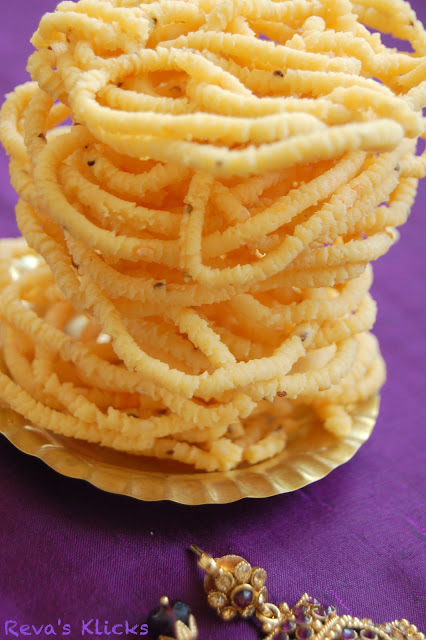 Murukku looks so so tempting! Beautiful clicks rev.. looks crunchy ! Like the technique used in making patterns on the slotted spoon before dunking into oil. Will try it next time. Also like how colorful the photo looks. wow..this is so amazing. i love the swirls and that tool is so handy! yummy!